It took me a long, long time to get somewhat good at horse showing. Going to a show and getting no satin pretty ribbons (oh ribbons, how I love you… let me count the ways) these days isn’t a huge shocker, because there were many, many shows in my past where I would be happy to come home with one 6th place. Eventually, I did start doing better than 6th and then I won some. 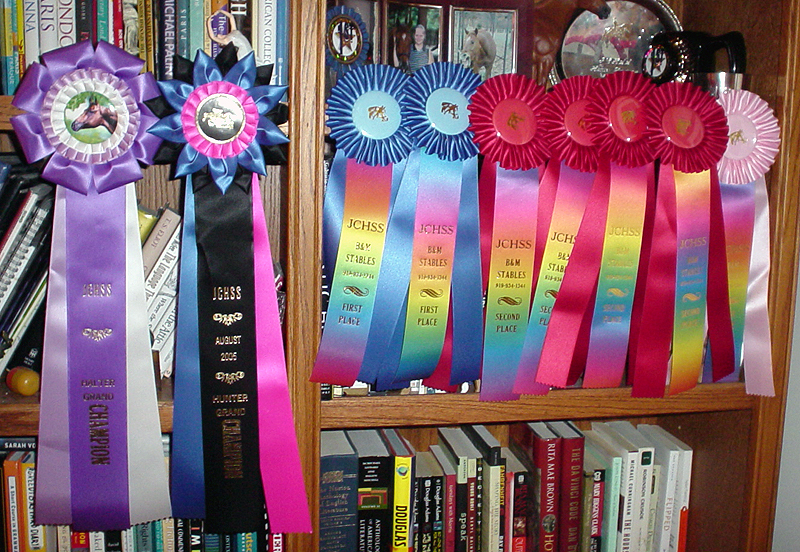 There are 3 ribbons in particular that stand out to me during my main time showing in college. When I first moved away from the back yard fox hunting barn to the hunter barn where the NCSU equestrian team trained at, I was introduced to tons of hunter/jumper schooling shows. We would go at least once a month, and they were always one day, cheap shows with divisions like “18” Hunter” and “2’3″ Learning Hunter” etc. Because Elvis isn’t a super scopey horse and never had changes, we usually stuck to the 18″ or 2’0″ division. At one of these shows doing the 18″ division against not so awesome company, I won my first ever champion ribbon. Should I feel amazing about beating a stopper? Or the little kid who couldn’t control her appy pony from bucking in the flat class? 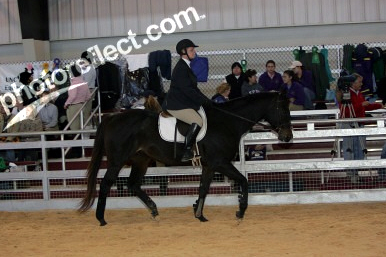 Maybe not, but hey showing is about being the best out there and that day for the first time ever we were! A show where I wasn’t competing against little children and stopping ponies was the Duke IHSA show with the NCSU Equestrian team. When I started riding on the team, I literally had forgotten my diagonals (that is how back yard and “stay on the horse” focused my riding was before I went to college). So you can imagine my happiness when after a year of showing in the Beginning Walk/Trot/Canter division, I won my one and only IHSA class! It as at the Duke Show (I don’t have a picture sadly), and as special awards to the winner they handed out mugs with a silhouette of a Devil (their mascot is the Blue Devil) jumping a horse. I still have that mug, and the ribbon is somewhere. I was so proud and my team was really happy for me. This was also the show that I pointed out of Beginning WTC into Advanced WTC. Where I’m from there is a schooling show series about an hour away that is really cheap, and really popular. They have everything from Western Pleasure to little hunter classes, and since it fit my budget and my horse’s talent level – we went there a lot. This is where I had my best and my worst horse show days. It was one of those show series where if the judge liked Elvis, we would win everything, and if they didn’t I would go home with a few default ribbons and nothing else but a sun burn. One of my favorite things about showing there was the halter division. Hunter shows don’t have halter, and halter classes fulfill my ego about my horse’s grooming and condition as well as his OK but not stellar conformation. 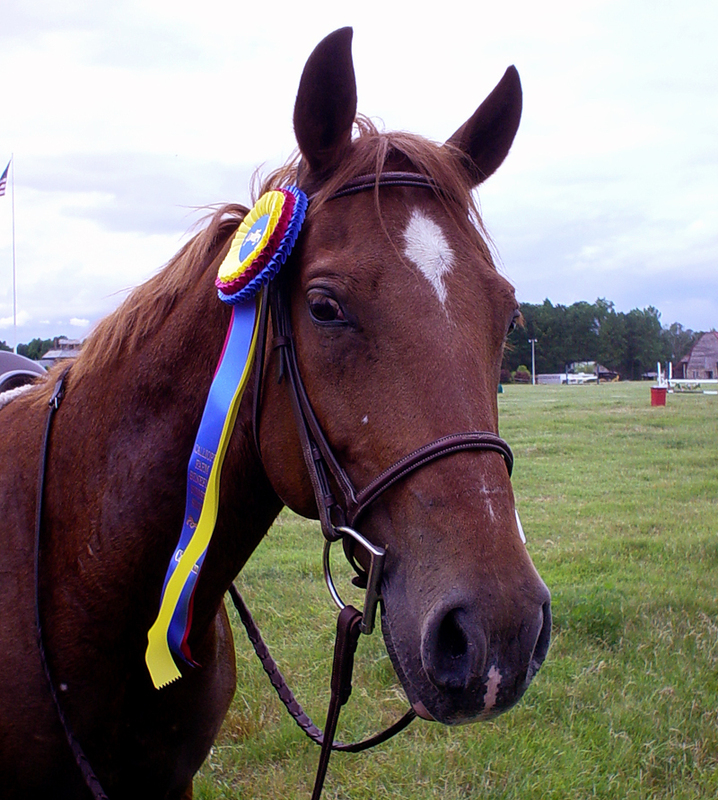 We would show in English Halter, Aged Horse Halter, and Adult Halter and had a blast. The purple ribbon to the far left is the one and only time we got Champion of the halter division (don’t ask me why it’s purple… they picked weird colors there) which was super fun. 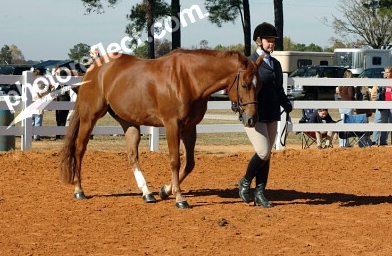 Showing halter at Johnston County, we both look so young!